Tomatosphere™ uses the excitement of space exploration as a way to teach the skills and processes of scientific inquiry. In the Seed Investigation, students examine the effects of the space environment on the germination of tomato seeds. As humans seek ways to travel deeper into space, we must discover ways to expand life-support systems. One possible solution is a plant-based system. Tomato plants are an ideal choice as they provide wholesome nourishment and water through transpiration from their leaves. Through photosynthesis, tomato plants also convert light energy and carbon dioxide exhaled by astronauts into oxygen that is needed for survival. 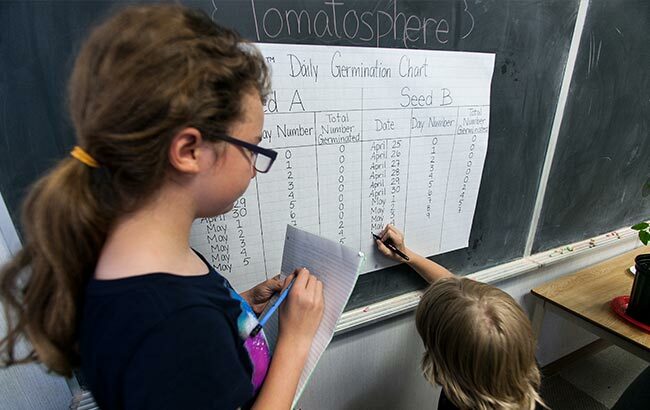 Tomatosphere™’s Seed Investigation includes planting two sets of tomato seeds (one exposed to space or space-like conditions and the other untreated), examining and recording the germination of seeds, and submitting the results. Follow the step-by-step guide below. 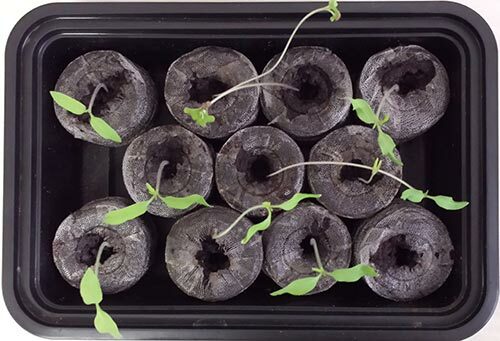 How does exposure to the space environment or space-like conditions affect the number of tomato seeds that germinate? 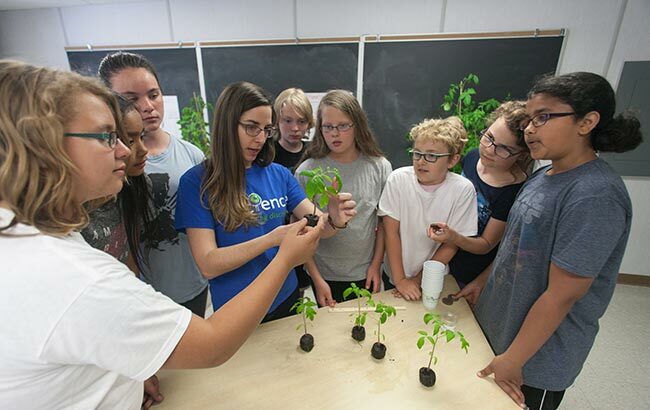 Tomatosphere™ offers an excellent opportunity to have your students think and act like scientists as they practice their inquiry skills and develop understandings of the nature of science and the concept of a fair test. 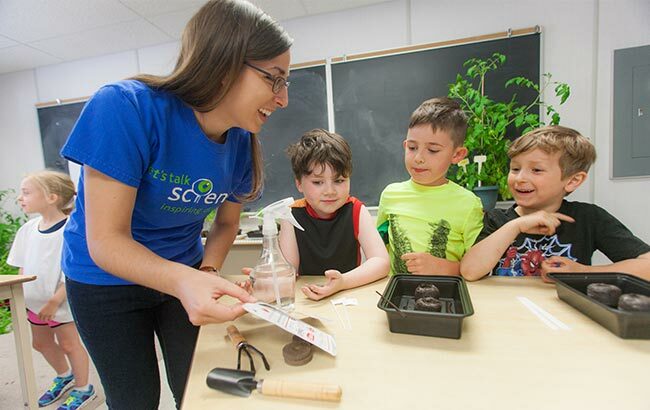 As students engage in the steps of the Seed Investigation these skills can be introduced and practiced with the support of a variety of resources and suggested learning experiences that are appropriate to different ages and levels of understanding. In the Seed Investigation, students will compare the number of seeds that germinate from two sets of tomato seeds. One set of seeds have been sent into space or treated in space-simulated conditions (“treated” seeds), and the other set of seeds (the “control” seeds), have not been to space or been treated in space-simulated conditions. The simple and well-designed Seed Investigation is a valuable tool for modeling a fair test. Fair testing is a key component of scientific inquiry and a common method used by scientists world-wide to provide evidential proof of their ideas and theories. As part of ensuring a fair test, you will not know which of the seeds have been in space, or if they have been treated or untreated, until the germination process is complete and results are submitted. When you go to order seeds, you'll be registered with a Let's Talk Science account if you don't have one already. Seeds are typically mailed out between February and April. You should receive an automated response once you submit your seed order. If you do not receive this or have other questions, please contact the Program Coordinator at tomatosphere@letstalkscience.ca. We recommend that you read through this guide and explore resources that support this guide. These learning resources provide opportunities to introduce and extend the learning beyond the Seed Investigation and offer suggestions on how to develop skills of inquiry and cross-curricular concepts. Initiate the planting of seeds on Wednesday or Thursday. It usually takes 5-7 days for the first seeds to germinate and students should then be present to see the first visible signs of germination. Do not plant the seeds prior to a school break, such as the traditional spring break or religious holidays, when you might not have the opportunity to water the plants properly, or when the temperature in the school may be lowered (which may affect growth). Seeds are sent out once a year between February and April, however you can choose to start the program in the spring or the fall. Once germination has occurred and the results are submitted, the plants may be transplanted to pots or outdoors, depending upon local conditions. You should receive two packages of seeds (marked with two different letters). One package contains the "control" seeds (untreated) and the other package contains the “experimental” seeds (treated), which have been exposed to space or space-like conditions. Containers should be at least 7.5 cm (3”) deep to allow for roots to grow. Yogurt cups, plastic take-out containers and margarine tubs are great choices or cell packs you get from the garden centre. All containers need holes in the bottom for drainage. Plant containers for seedlings need to be very clean to avoid disease and should be disinfected by a teacher with a mild bleach solution before use. Peat pellets are the simplest growing medium but you can also plant the seeds in potting soil. When soaked in water, peat pellets grow to seven times their size and have nutrients that seeds need to grow. These pellets can be easily transplanted into larger pots or a garden when the seedlings are ready. You can purchase your peat pellets from Stokes Seeds or locally, such as at a dollar store. 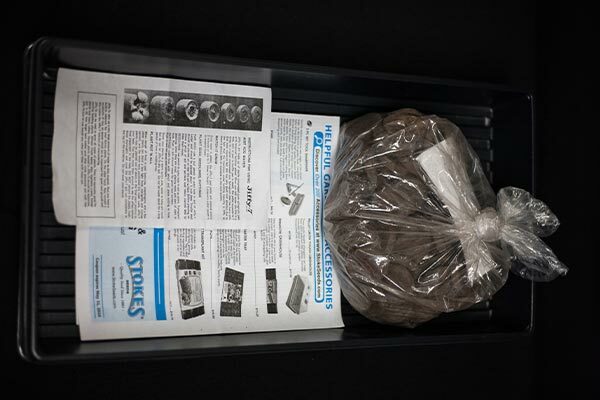 You can also purchase a seedling tray for the peat pots with a clear plastic roof, creating an instant greenhouse (a seedling tray comes with the optional Stokes Seeds® Tomatosphere™ Starter Kit). Be careful not to allow excess moisture (humidity) in the tray, as it can lead to fungus growth. Simple daily ventilation of the "greenhouse" by taking off the lid will prevent this problem. 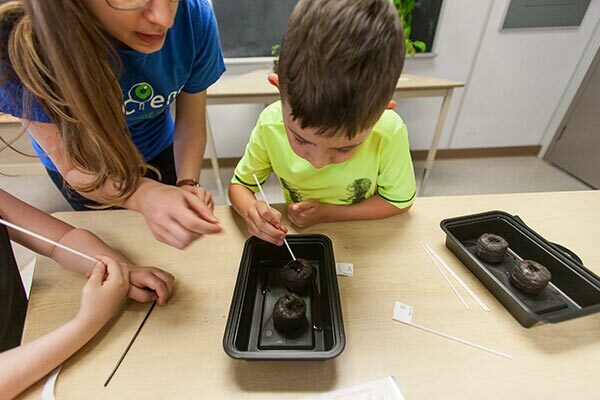 You will need a place in your classroom/learning environment that provides the best available conditions for germination, and where all the planted seeds can remain throughout the inquiry. Tomato seeds do not need light to germinate, however, if you are planning to use the seedlings for further inquiry, they will need to be placed near a window or a grow light for at least 8 hours a day. Seeds need a warm environment during the germination phase. If the air outside the school is cold at night, do not leave the planted seeds along the windows unless protected from the cold. Newspaper between the windows and the plants will help. Plant the seeds on a Wednesday or Thursday, and NOT before a holiday Monday. How you introduce Tomatosphere™ is up to you. 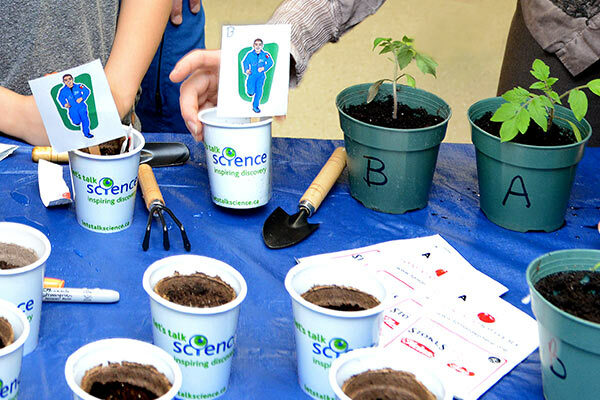 The Introductory Learning Activity Suggestions in each of the Resources by Grade has age-appropriate suggestions and scenarios that can be used to initiate and engage students in the Seed Investigation. Soak the peat pellets in warm water for about 40 minutes, or until fully expanded, prior to planting. Put each peat pellet (or soil) into an individual planting container. Alternatively, you can use a seedling tray to hold the seeds and pellets (or soil). Label the planting containers accurately with the letter on the seed package. Individually, have each student press one seed into each peat pellet (or soil) to a depth that is about the same as the length of the seed (2-3 mm). Ensure your labelling is accurate so that the seeds do not get mixed up. This is very important for accuracy of the final results. To ensure a fair test is conducted, make sure both groups of seeds are exposed to the same conditions (i.e., heat and water). The peat pellets (or soil) should be kept moist during the germination phase. Check the peat pellet or soil daily to ensure that it is damp to the touch, but not soaking wet. Add water accordingly as needed. The watering schedule may vary depending on the humidity of the room. Remember to water the peat pellets or soil before leaving for the weekend and as soon as possible upon return. It is important that the peat pellets or soil does not dry out. The primary objective of the Seed Investigation is to determine the number of seeds that germinate compared to the number planted for each of the two types of seeds (treated and untreated). A seed can be considered to have successfully germinated when two (2) distinctly separate cotyledons (embryonic leaves) can be seen (image below). Record how many seeds germinated each day for 2-3 weeks or until 5 days after the LAST seed germinates. See the example observation chart below. Use a plastic stir stick to mark when each seed has been recorded . After submitting your results, you will receive an automatic response revealing the identity of the two types of seeds (i.e., control vs. treated). Your username and password that you used when you registered. All results need to be submitted prior to the end of the following January. After submission of your results you will receive a Certificate of Participation via email that you may print off for each of your students. 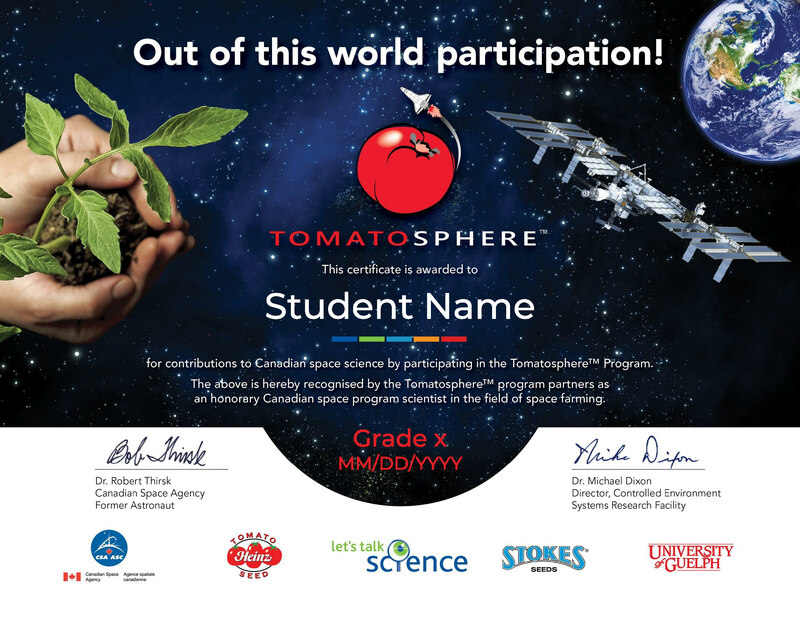 The certificate is signed by former Canadian Space Agency astronaut, Dr. Robert Thirsk, and the principal investigator for the Tomatosphere™ project, Dr. Michael Dixon, University of Guelph. If you wish to receive Tomatosphere™ seeds again next year, remember to order seeds. You are NOT automatically signed up to receive seeds from year to year. You can also follow us on Facebook at Tomatosphere Canada or Twitter (@Tomatosphere).